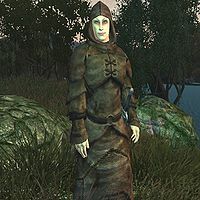 Zealots are extremists who support Sheogorath and believe that Arden-Sul was his mortal aspect. They consider everyone else to be non-believers and Heretics. They tend to make camp on the Dementia side of the Isles. Like everything in the Isles, they have an equal, polar opposite, that is to say, the Heretics of Mania. Like conjurers and their Heretic counterparts, Zealots usually rely on summon spells in battle, while also firing Destruction spells and healing themselves. They tend to favor blade weaponry to blunt weaponry. There are 12 types of Zealot: Ascended Zealot, Preserved Zealot, Zealot Arbiter, Zealot Crusader, Zealot Guard, Zealot Guardian, Zealot Matriarch, Zealot Minion, Zealot Missionary, Zealot Neophyte, Zealot Patriarch, and Zealot Prosleytizer [sic]. It is possible to take their robes and deceive other Zealots through disguise, but only at a distance. If you get too close, they will see through the ruse and begin to attack. Even after you have become Sheogorath, many will still attack you. "Boss" Zealots have an identical spell set to regular Zealots, with the exception of a higher-level Summon Flesh Atronach spell. Zealot Guardians have an Aggression of 90, which means they can be talked to much more easily than other Zealots, all of whom have an aggression of 100.